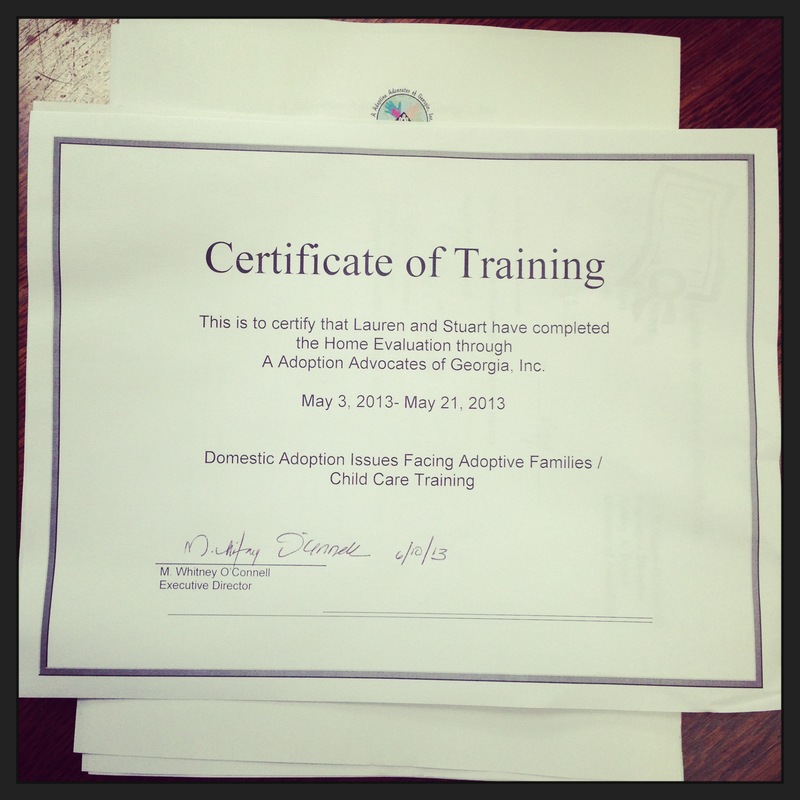 Stuart and I are blown away by the generosity of so many friends and family willing to contribute to our adoption. 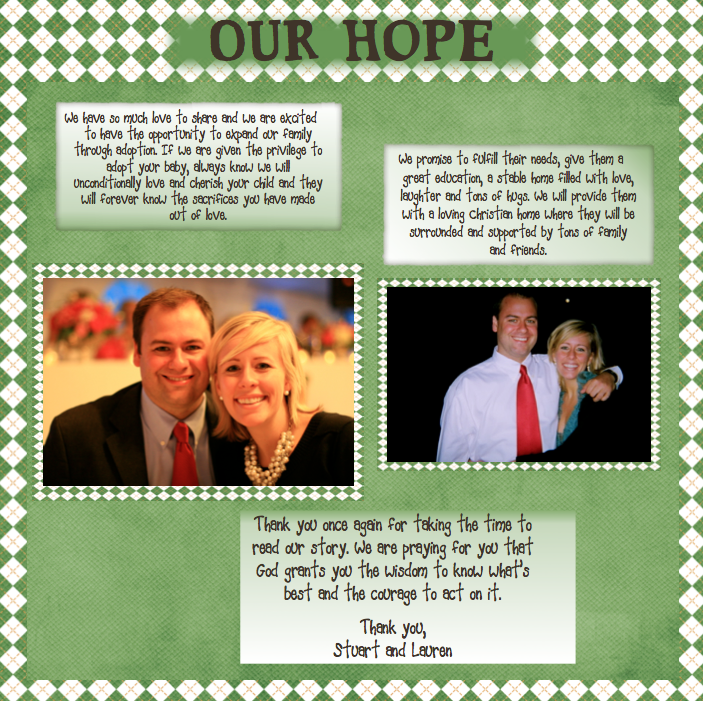 The outpouring of love and support has enlarged our faith and encouraged our hearts. Currently, we have raised $25,000 through the generosity of so many of you! This is such a humbling reality for Stuart and I. We feel extremely supported in our decision to adopt and change a life forever. It’s amazing to think that one day we get to tell this child that they were wanted so badly that hundreds of people gave to make their life a reality. Thank you!!!! For those of you who have given, thank you for the sacrifice you have made! For those of you who have prayed for us during odd hours of the day, thank you…we need it and have felt every prayer! For those of you who have sent a text or an email to let us know we are in your thoughts, thank you for making us feel so special! We could not do this journey alone. God never called us to do this by ourselves. You are part of God’s mission to change a life forever through adoption and we are forever grateful! *All donations must be postmarked by Monday, September 9th otherwise they go to the general HandinHand adoption fund and will not be applied to our specific adoption. Thank you for being our community of friends and family who have been the greatest champions for us! On behalf of a child’s life who will be changed forever, thank you! ::Page-Turner: A very interesting, exciting, or suspenseful book, usually a novel. 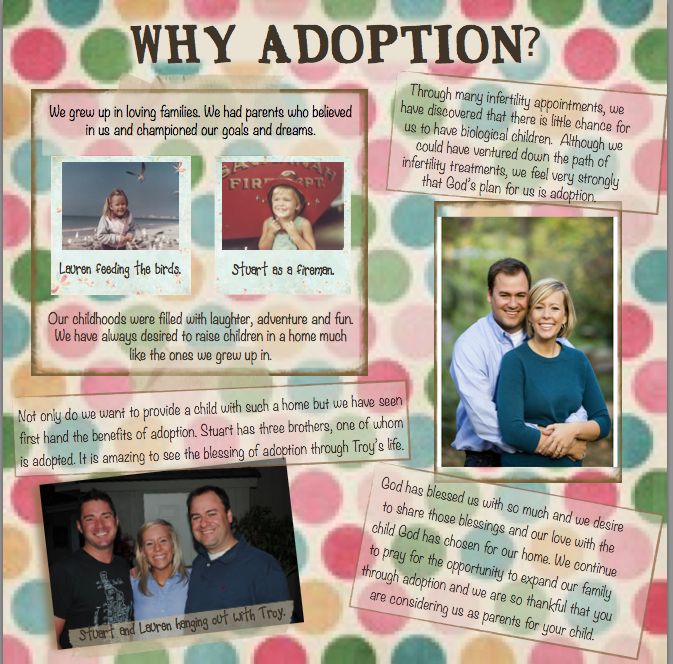 The author of our adoption journey is writing quite a page-turner these days. With every sentence, he is revealing more of himself and reminding us that he, in fact, is the author of our story. Just when a situation appears hopeless, he turns the page revealing a completely new and exciting chapter. When circumstances appear stale and stagnant, he writes in a twist that you never expected. When the crisis feels unbearable, he introduces the supporting staff of family and friends and when the future looks tragic, he introduces himself as the hero…the ever-constant, faithful One you knew would rescue you all along. These past two weeks, God has been busy writing this page-turner. 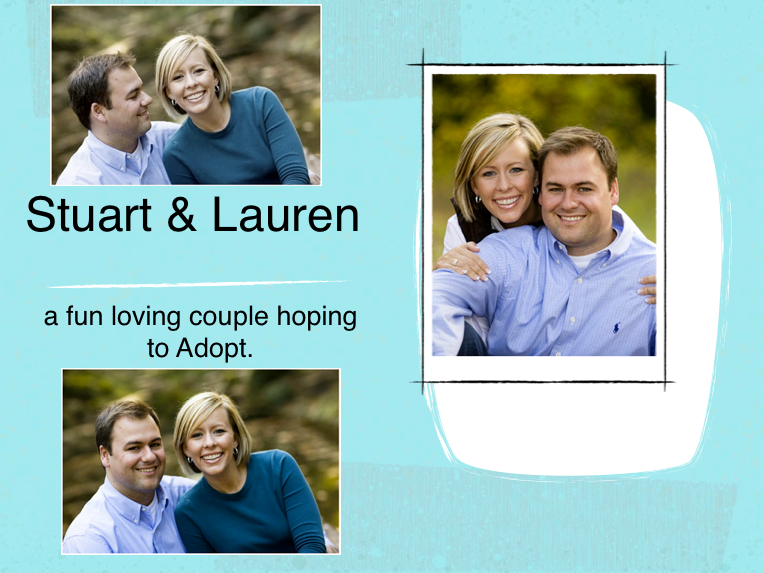 We have had two adoption opportunities that have sprung up for Stuart and I. The decision before us was whether or not we wanted our profile presented to two birth mothers. We spent countless hours praying, talking, seeking wise counsel, etc. We have decided in both situations not to move forward. This has been hard on us and yet we know that God is clearly saying “no” to these specific situations. It’s extremely difficult to say “no” to what appears to be a great opportunity in the present. But God is writing the story, not me. He knows the end. I know only what I’ve read so far. I’m not going to lie. These past two weeks for me have been hard and filled with several hopeless moments. But God has reminded me that he is turning the pages of our story and I need only to keep reading. As I do, another chapter reveals that he is far more faithful than I realized. With every disappointment this past week, God has brought alongside a blessing, an encouraging text, a good friend and I’m reminded we are not alone. He doesn’t want me to dwell on what was or what may appear to be a missed opportunity. He is moving me/us on to the next chapter, so I don’t need to keep reading the previous chapter over and over again. Like any great writer, God’s story of our adoptions has a fascinating plot filled with high and lows, conflict and resolution, protagonist and antagonist, the moments you want to give up and the moments you think life can’t get any better. God is writing some story in these days and our role is to keep on reading and trust that his conclusion will be for our good and his glory. I love that God put this on my heart today because we are in the thick of it. We are hours removed from saying “no” to situation #2 and yet I KNOW with full assurance that as today’s chapter ends, tomorrows will hold a new theme. A new start. A new opportunity to trust the author and perfecter of our faith! God has blessed us with so much! Even in the disappointments, we know he is only further clarifying HIS plan for our family. This weekend God gave us a tangible blessing that we really needed. This past Friday night was a pretty chill evening as I roamed through Kroger looking at cleaning supplies. (I’m crazy like that :-)). I happened to look down at my phone and saw an email from Hand in Hand Adoption. Hand in Hand Christian Adoption, Inc. is a non-profit private operating foundation that offers grants to adoptive families. (handinhandadopt.org) We had applied with them for an adoption grant and were anxiously waiting to hear whether or not we were awarded one. As I scrolled through the email, my heart was racing and I couldn’t read fast enough. Then I saw it, the news we were waiting for…we were approved for a $5,000 matching grant!!!!! I almost started screaming in Kroger but instead I cried…seriously! What a huge blessing and what an amazing organization. Hand in Hand will never know what a gift this grant has and will be for Stuart and I. Hand in Hand not only matches dollar for dollar up to the awarded amount but any funds received over $5,000 go to our specific adoption expenses such as agency fees, attorneys, airfare, etc. Our adoption will be around $40,000 so the opportunity to raise funds through Hand in Hand is the greatest blessing yet. The even better news is that all these donations are tax-deductible! For the first time in awhile, I breathed a huge sigh of relief. Before getting the news, I knew God was with us but upon receiving the news I was reminded that God is for us. It’s almost as if this email was a whisper from him to say, I’m still in this with you and working on your behalf. He truly is the one who knows how to supply all our needs. So, it was an amazing trip to Kroger that night and a much needed reminder that He is at work! Now we can really start fundraising. With every open door this precious child seems closer and closer to be in our family. Thank you for praying for us even when you don’t know what you are praying for specifically. God is using your prayers to give us favor and wisdom in these days. He is at work to place the lonely in families (Psalms 68:6) and we are honored to be a part of his plan. Please send all donations made payable to “Hand in Hand Christian Adoption” postmarked by August 30th to: (for tax purposes please include our name on the outside of the envelope only…do not put our name on the check itself). Hand in Hand Christian Adoption, Inc. I love this quote. Regardless of what season of waiting I’m in, I have always found comfort knowing that my uncertainties and unanswered questions are all part of the process of waiting on God. In fact, these uncertainties and questions are actual requirements for waiting on God. Part of the waiting process is hashing through the unknowns and being reminded that “the unknowns” are not unknown to the all-knowing. Waiting on God is hard but waiting on God is worth it. Our adoption journey is teaching me anew how to wait on God’s timing instead of relying on myself to take action. Often I find myself moving in a direction and informing God that he needs to move with me. I assume that if I don’t act then God won’t know that he needs to act on my behalf. Adoption is teaching me how to move with God not ahead of him. I love the posture that this song promotes that we (your people) will not take a step without you (our God) directing us! I love this principle of waiting that we must not move without God leading us! God has used the adoption process to remind me of this principle. Recently, we had the opportunity to be presented to several birth moms. When you’re presented, a BM reads your profile book and family information and decides if they are interested in you as the adoptive parents. If interested further talks ensue. It’s been very exciting to have the opportunity to present and challenging as well. 1.) Thank God for giving me Stuart who not only deals with my action-oriented personality, but also constantly reminds me of God’s plan in all this. 2.) Resolve to not move unless God does. I’m learning to position myself behind him instead of running ahead. As I remain in this posture, I find myself not moving without him. This is the best place to be in the waiting. I’m learning to wait. I’m learning to rest. I’m learning NOT to move without him. At 25, this was a place I tolerated to get a gift for my friends who got married and pregnant “early” in life. It was a five minute interchange of printing a registry, finding a $25 gift, and getting out of there without a toddler having a melt-down in the check out line. At 30, I found myself asking a different question…a harder question…”Will there be a time for me?” Visiting a baby store became a reminder of a season I desperately wanted but couldn’t be in yet. It was hard. It was emotional. I couldn’t drive past a baby store without thinking, “I’m missing out on something others get to be a part of.” I opted for chipping into a larger gift just to avoid the store all together. 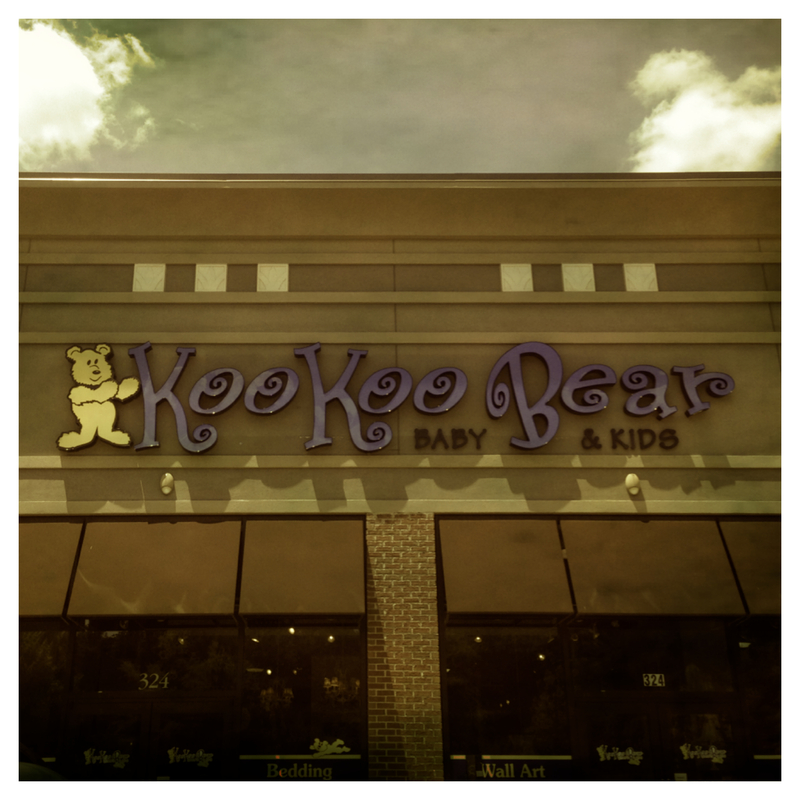 At 32, I walked into my first baby store filled with no other emotion than complete delight! It was thrilling to to look at bedding, clothes, little shoes, diaper bags, etc. It was freeing to pick up onesies and have no other thoughts in my mind except, “my child will look adorable in this.” It was life-giving to be in a room with women who had baby bumps and cherish the thought that we are both going to be moms. It was empowering to feel like I actually deserve to be in this store…I’ve got one on the way just like everyone else. Stuart and I are blessed with the greatest friends anyone could ask for. One of the greatest among those being Kristen Franklin. 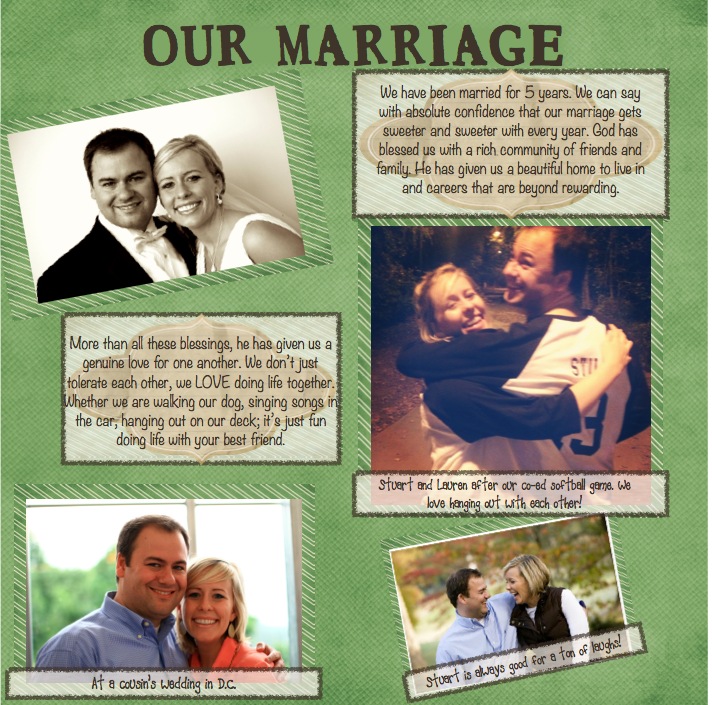 Kristen is an amazing friend and my co-worker at Gwinnett Church. Kristen is one of the most selfless women I know, willing to do whatever is needed. A couple of weeks ago, I was in Kristen’s office stressed about our profile book and not feeling good about my creative efforts. I showed Kristen what I had tried to pull together as a “creative look” for our family profile. It was laughable to say the least. In fact, check it out. I’m sure out of deep pity, Kristen could tell how hopeless I was. Being the rock-star that she is, she swooped in with her profile super powers, creativity and her “I can learn everything from google” mentality and made a boring family profile into the masterpiece it is now. 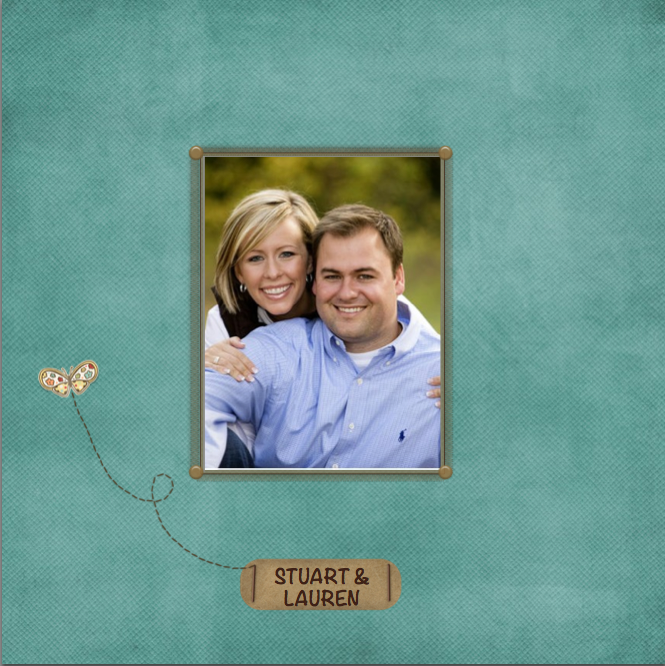 If you are not aware, a family profile book is what the BM and BF will look at to chose what adoptive family they want to place their child in. 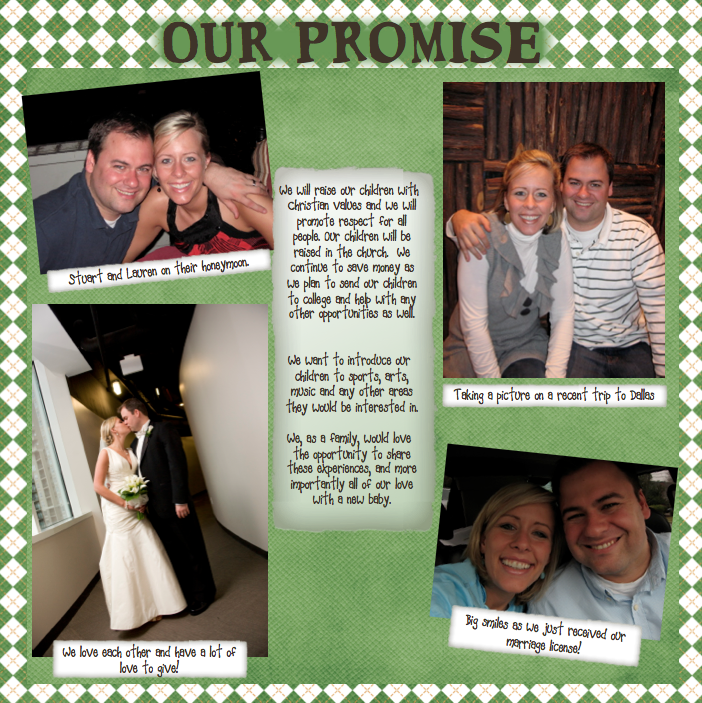 When we say first impressions are everything this is very true when it comes to the family profile book. Kristen went above and beyond to make our first impression to a BM and BF unforgettable. I cannot get over the community God has surrounded us with and the people along this journey that he has placed in our path to help us down this road. Kristen, thank you for being an influential person in my life and a dedicated contributor along our journey toward adoption. We love you! Here’s a few pictures of her masterpiece! We are Home Study approved!!!! It’s official! We are Home Study approved and ready to be matched. If you have ever done a Home Study you are aware of how much paperwork, filling, copies, etc. are required. It was a lot of work, but nothing beats knowing that we are officially one step closer to meeting our child. It’s a good day!